It’s been a while since I had posted my last recipe in this blog and today I am not going wasting any time by giving any excuse for that. Off late, I am enjoying Instagram a little more than other social networking sites. I love posting pictures of my day-to-day cooking on Instagram. Since it’s all about pictures, there is less effort required to write about the recipe. Sometimes I also like to post pictures about what’s happening in my daily life. So if you are not already there, please follow me, my Instagram id is #mixandstir. Anyways, I have some good news for you. I have been associated with a unique and fun campaign with Muir Glen & the National Co-Op Grocers. Muir Glen is a very reputed brand in the USA for their different products like organic tomatoes, pasta sauce, and salsa. Thank you @thefeedfeed, the popular social networking company for giving me this opportunity. Do you know how the best quality of tomatoes come from Muir Glen? Because it focuses on the following three principles - 1. Organic 2. Pollinators 3. Zero waste. In order to grow a better tasting tomato, they believe it must be grown organically. Their farmers in the Sacramento Valley of California work together with local pollinators (aka bees!) to keep a healthy ecosystem and produce the best tomatoes possible. However, not every tomato is good enough for the cans, which is why they have created a composting facility for any tomato waste. Muir Glen focuses on working in harmony with their environment because it’s what makes their tomatoes taste better and the planet a happier place. As part of this fun campaign, I have also been introduced with co-op grocers. Once you start buying the groceries from Co-Op grocers - you never go back to the regular grocery stores. While reading about these Co-Op grocers, came to know about interesting facts. As locally owned businesses, co-ops are committed to the people they serve and the communities they live in. Owners can have a voice in what is available for purchase, as well as in the overall organization of their particular co-op. Owners get the most buying power for their money, and profits stay in the community, contributing to its economic strength. I have bought all the ingredients from the Co-Op called People’s organic food market located in the Ocean Beach area in San Diego. Like other cooperatives, Ocean Beach People's Organic Food Market, a California food cooperative, operates according to the seven Cooperative Business Principles. It was born as a small neighborhood buying club in 1971. I love the seven cooperative principles those they follow 1. Voluntary, Open Ownership 2. Democratic Owner Control 3. Owner Economic Participation 4. Autonomy and Independence 5. Education, Training, and Information 6. Cooperation Among Cooperatives 7. Concern For The Community. Here are the specific mission and vision statements from this Co-Op that has really impressed me. Mission: To operate retail vegetarian consumer cooperatives providing high-quality natural products at a fair and reasonable price. Vision: The Cooperative is dedicated to helping people live in ways that are ecologically sustainable and that promote personal health and well-being. Values: We believe that consumer ownership through a cooperative structure provides consumers with an optimal democratic forum to meet the needs of our community. Over the years, the Co-op has grown to serve many Owners from many different locations. There is a promotion going on, you can stock up on Muir Glen products. Now let's come to the actual recipe. 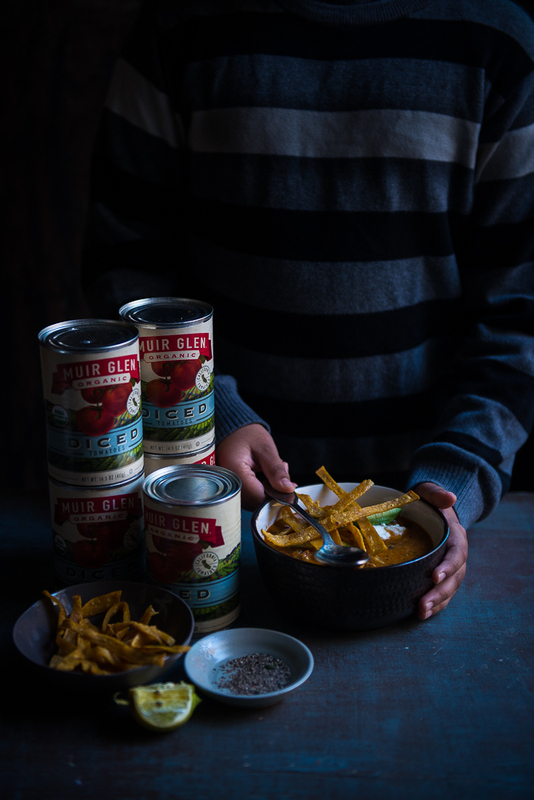 Today I will share a Mexican-inspired soup, using Muir Glen Fire Roasted Tomatoes. The Soup is called Tortilla soup, to cook it from the scratch will take not more than 30 minutes. 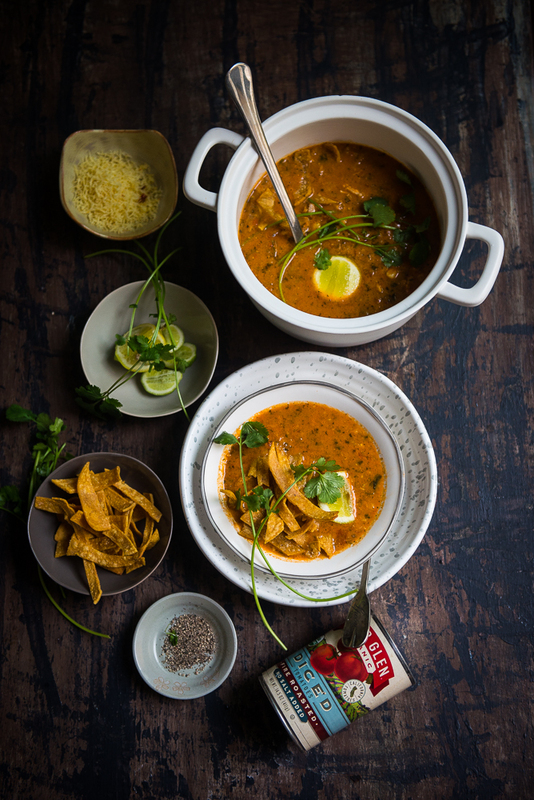 You can prepare tortilla soup in Instant Pot or slow cooker or on the stove top. 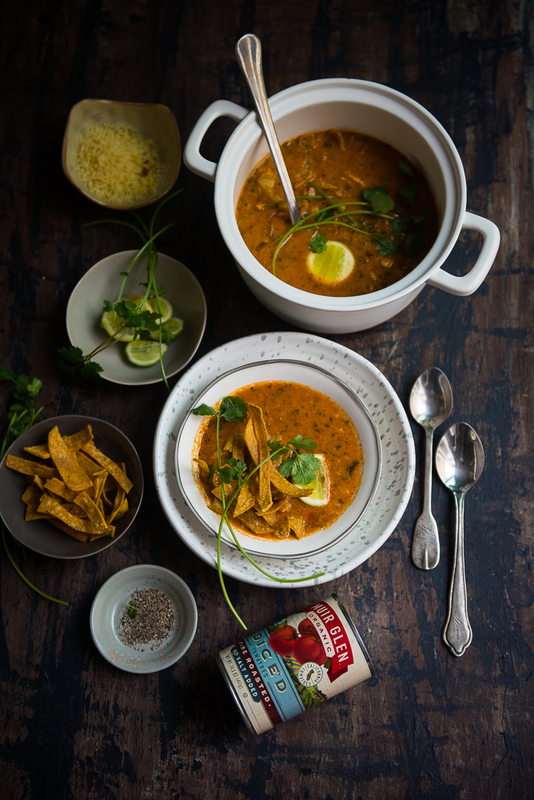 The fire roasted tomatoes, spicy chilis, bold seasoning, and corn tortillas make the flavorful soup. I have used, chicken stock and shredded chicken both here if you are vegetarian, just skip the shredded chicken and use vegetable stock instead of Chicken broth. This soup is very much a Mexican version of tomato soup. This particular recipe is a bit spicy, the way my 11 years old wanted. I added a jalapeno and paprika. If you want your soup little milder, just skip the jalapeno. The recipe is very flexible. To make this soup extra delicious, add some toppings at the end. 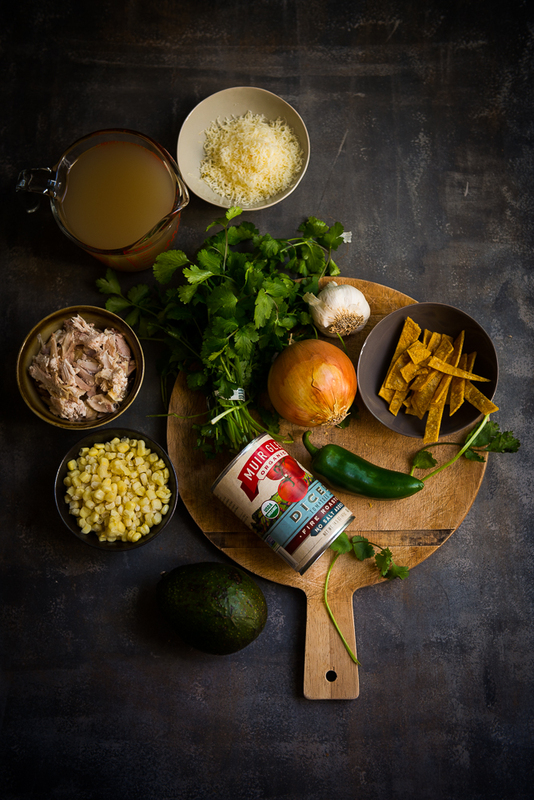 You can add your choice of toppings, such as sour cream, shredded cheddar cheese, or pepper jack cheese, chopped cilantro, chopped onions, sliced avocado and don't forget to add some crispy fried corn tortilla chips. 1. Cut the corn tortillas into 1/2 inch strips. 2. Take a large baking sheet, lightly spray with cooking spray. Add the tortilla strips and toss with 1 or 2 tablespoon vegetable oil. 3. Arrange the strips in a single layer and bake them at 425 degrees F for 10 to 15 minutes or until it becomes light golden brown. Once it is done sprinkle with salt and keep it aside. 1. Heat a large saucepan over medium-high heat. Add 2 tablespoons olive oil and heat it up. Add onion, garlic, and jalapeno and saute for a few minutes, until the onion becomes translucent and jalapeno is soft. 2. Add cumin powder, red chili powder, salt, and pepper. Stir it to mix it well and cook it for another 2 minutes. 3. Add the Muir Glen Fire Roasted tomatoes with medium green chilies. Then add the chicken stock, cilantro and half of the tortilla strips. Bring the mixture to a boil. Lower the flame and simmer it for 30 minutes. 4. Using an immersion blender, blend the mixture until smooth. Add the shredded chicken and corn. Adjust salt and pepper as needed. Keep the soup over low heat for another couple of minutes. 5. 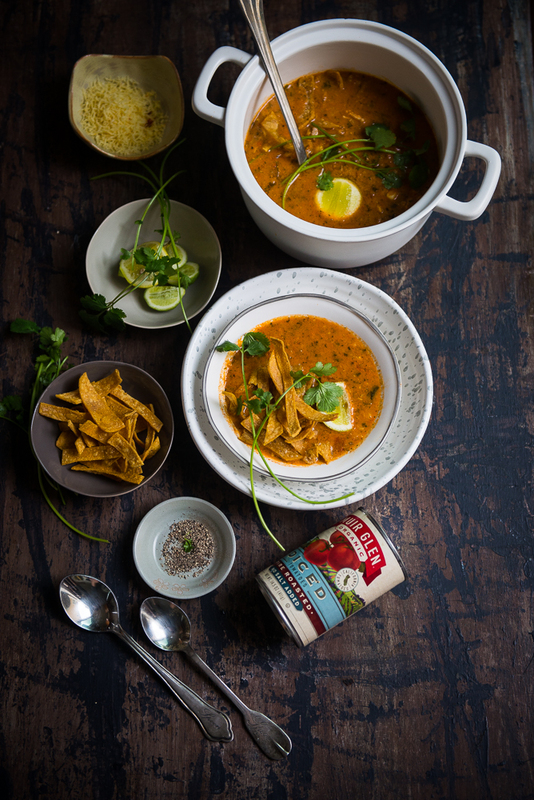 Transfer the soup into bowls and top with cheese, sour cream lime juice, cilantro, and crisp tortilla strips. 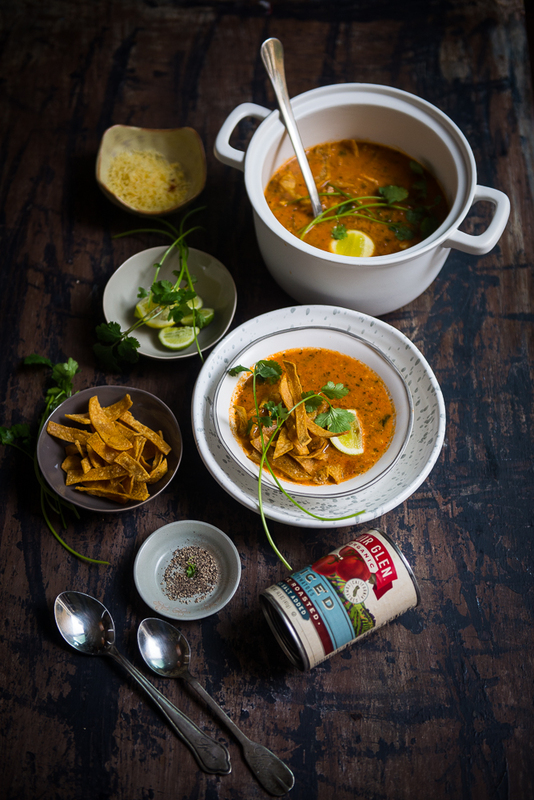 Enjoy warm Chicken Tortilla Soup with your favorite toppings.